I would like to turn something like this into a publishable paper. If there is anyone who would wish to collaborate, please feel free to write me. In 1959, the renowned American anthropologist, George Murdock, published “Africa: Its peoples and their culture history.” Despite having little experience in Africa, Murdock used available resources to create a comprehensive picture of the distribution of ethnic groups throughout Africa. The study of ethnicity in any context is fraught with inherent difficulties. Ethnicity is fluid, with members of ethnic groups defining and redefining their respective ethnic groups in response to personal, economic and cultural changes. Marriages can change ethnic definitions, the attraction of certain social services can induce changes, and the need to band together against common enemies can prompt the formation of new, unseen ethnic groups. The American model is a prime example. Whereas 70 years ago, the United States provided home to a number of ethnic subgroups such as Poles, Ukrainians, Irish and Germans, we have boiled down our ethnic definitions to create a comprehensive group of white Americans, largely defined in contrast to that of marginalized minority groups. Similarly, people of Asia, Africa and worse yet, “Muslims”, seen through the lens of European societies, are often classed into the same ethnic group, despite having little relation to one another historically. To top this off, any geographic assessment of ethnic boundaries can only be viewed cross-sectionally, spatial boundaries of ethnic groups subject to adjustment in response to temporal factors such as migrations, warfare, weather events and economic opportunity. Despite these limitations, Murdock’s perhaps naive map remains an important and unique resource for Africanists. Assessments of spatial distribution of events within Africa are plagued by difficulties presented by the present political boundaries. These boundaries often inefficiently reflect the distribution of ethnic and social groups, and more reflect the exploitative priorities of colonial powers and, to a lesser extent, obstacles of topography such as rivers and impassible mountain ranges. Murdock lists no less than 835 ethnic regions, likely largely characterizing distinct linguistic groups. He likely overlooks linguistic and cultural variation within these defined groups, and, of course, lacking the benefit of large scale surveys, partitions groups with little regard for the myriad ways in which humans identify themselves. I can safely say that he gets it wrong in Malawi, listing only three ethnic boundaries in a country that lays claim to at least 20 self-identifying groups. Incredible. For a continent that houses less than one sixth of the world’s population, the level of human variation is staggering. If Africa were to establish it’s national borders based on ethnic or linguistic identification as Europe has, the number of resultant countries would dwarf that of the number of countries of the present world combined. Using the ACLED database, I counted conflict events within each of Murdock’s spatial designations. I did this to obtain a finer level of the distribution of conflict, and to likely obtain a more realistic picture of the extent of conflicts, which are sometimes (but certainly not always) waged along ethnic lines. What we get is the two maps below, one being conflict events based on present state borders, and the other on Murdock’s map. Blue indicates low numbers of conflict events, red indicates high numbers. The difference is striking. Looking closely at the map, one can see that conflicts events largely occur within Murdock’s ethnic boundaries. 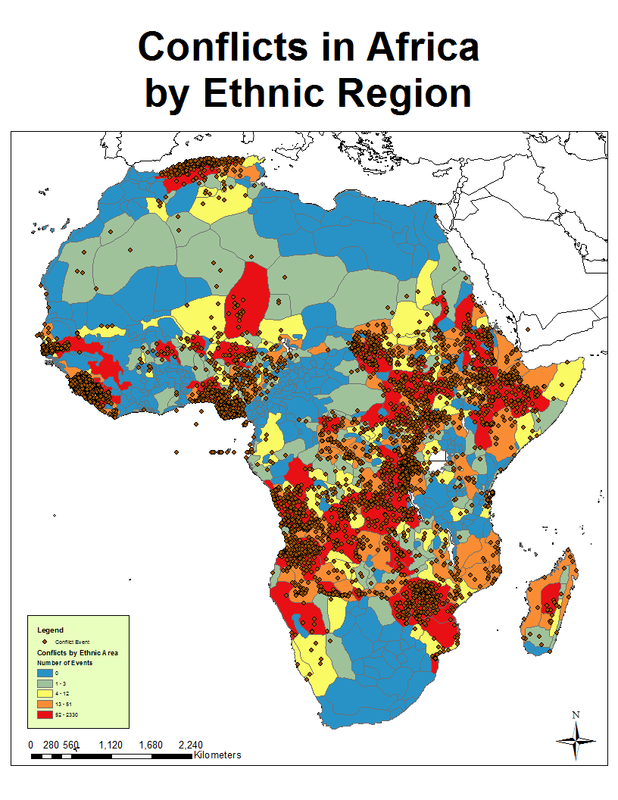 Now, before one jumps to the conclusion that all conflict in Africa is ethnically motivated, conflict events often occur near rivers or state boundaries that are set by rivers so it is no surprise that these maps might match up. Also, generating any type of higher level partitioning of geographic areas will result in a more informative map. However, these results should at least inform future analytic methods, based not on existing political boundaries, but rather on unseen local delineations, some of which may or may not be readily apparent nor accessible. Conflict events are largely concentrated along a swath that spans the southern region of Sub-Saharan Africa, with spatially sparse events occurring in the west. The largest number of events occurs within the borders of Zimbabwe, nearly all of which have been violent actions against civilians by a repressive and brutal government. Thanks to Prof. Nathan Nunn at Harvard for providing a shape file of the Murdock map. Not to mention the gaikokujins! hi! I m a student from Athens and I m making my thesis, which is about an emergency shelter for Africa. is there a chance you could send me your maps in higher resolution and the shape file of the Murdock map as I want to make some more maps for my presentation? When do you need them? What resolution? I’ll be glad to help with anything you need. the sooner you can send me the better and the highest resolution would be perfect. 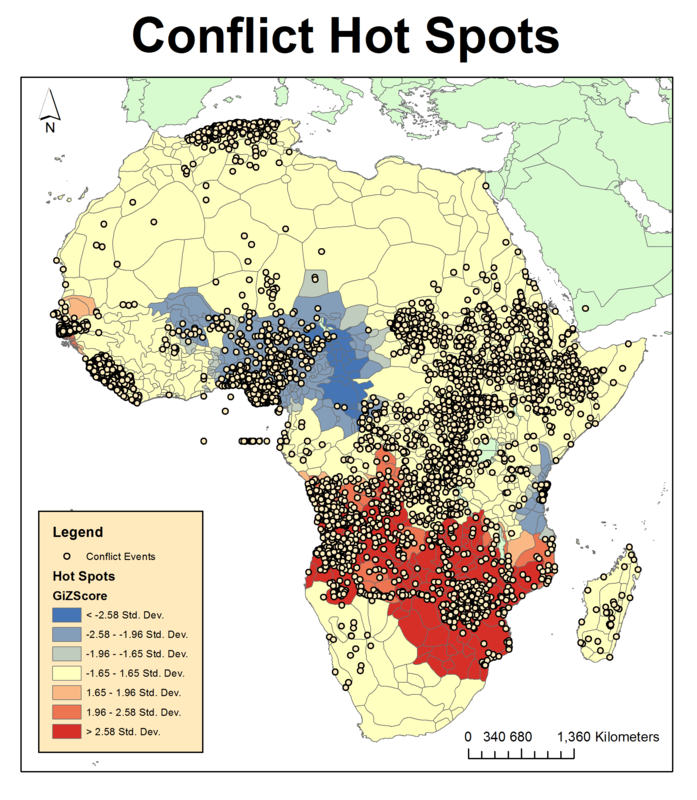 I had found the 4 original murdock maps from a document of the World Health Organisation but especially the two maps you made comparing the conflicts by state borders and ethnic regions are simply enlightening about part of the real causes of African wars. I’m a final year student at Bristol University and am carrying out a project which investigates the role of transboundary protected areas in promoting peace in Africa. Like Vasilis, I would very much like to get my hands on higher resolution versions of the maps on this page. 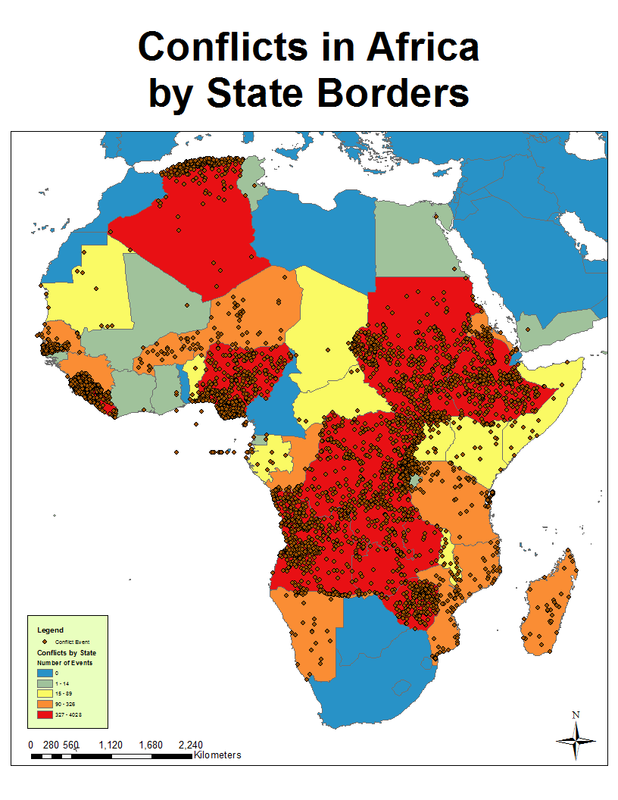 In particular the ‘Conflicts in Africa by State Borders’ and ‘Conflict in Africa “Hot spots” ‘ images. If this is at all possible it would be very much appreciated and would help me greatly. if you don t get a response from Pete I have made a bigger resolution maps of the ”Conflicts by State Borders” and ”vy Ethnic Regions”, and some others concerning the ”Slave Trade” and the ”Level of Distrust”. Just send me your email and I can send them to you in pdf or jpeg format. I have also the original Murdock maps in quite good resolution if you need them. Take care and good luck with your project! I just posted the high res version of the graphics on this page. It gets me off the hook! Wareen Whatley work on the slave trade is excellent. I highly recommend that paper. I’ll have to check the Donald Wright paper. which discusses similiar ideas to those put forward by yourself. I’m János Besenyő (PhD) from Hungary and dealing wth African peacekeeping missions. Is it possible to get the higher resolutions maps? And maybe we could work together if you are interested. Could you send my the shapefile that you used to make your maps? I got it off Dr. Nunn’s website at Harvard. I think you can download it there. What code did you use to generate the maps? Is this publicly available? I used ArcGIS. There is no code for it, I just put them together. If you need some help, please let me know! I was wondering between what years is the data reflecting on the maps regarding conflicts? I am working on pretty much the same thing, but specifically focusing on Sudan for a project for my GIS class. Is it alright if I use you as a reference? I’d like to chat with you a bit about this if you have the time! Of course! I am happy to chat any time. Email me at pslarson2@gmail.com. Dear Dr. Larsen. Thank you for this very interesting article. Have you updated it at all since 2011. And can you possibly provide the timeframe for the conflict data (i.e., was it all in 2011 or over some fixed period of time)? Thank you. 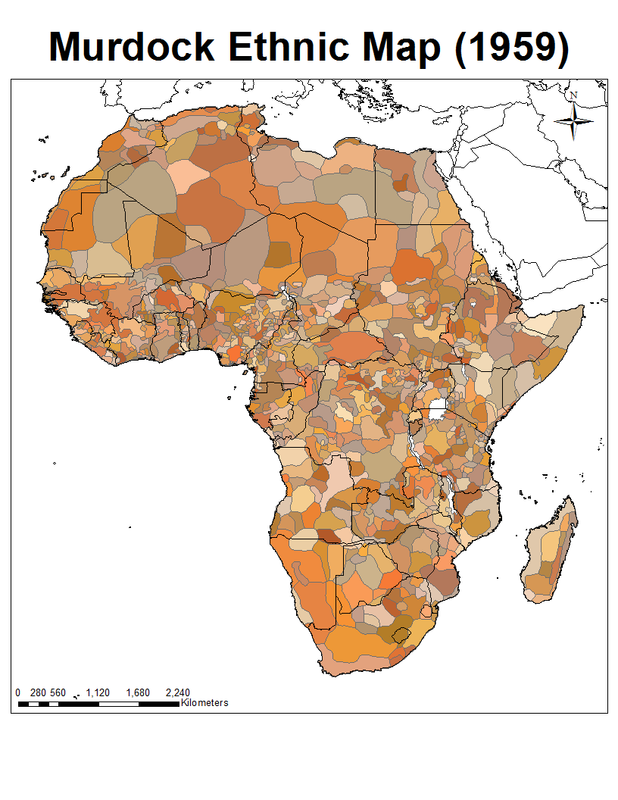 Great maps proving my graduate thesis on political risk modeling in Sub-Saharan Africa. If you look at the level of conflict since becoming a nation/ state and the methodology of colonization by each of the western European countries, you will see the correlation. “Not all countries were created equal.” This thesis for political risk modeling also works in Latin and South America, the Middle East and SW Asia. I would be interested in collaborating with you. I have a GIS degree and an interest in this topic. I’m writing a blog post at the moment about the effect of borders created by, and for the advantage of, colonists but then handed over to indigenous or local groups. It seems this has happened throughout Africa and South America. I’m looking for your help in some analysis I’d like to do. I have a question about Africa. I’ve finished writing two out of the three blog posts I want to write about borders and dictators created by countries ‘inside the wall’ on DT Architects’ map: (http://td-architects.eu/projects/show/walled-world/). Only thing is, I want to do a bit of GIS analysis of the world’s borders created by colonists and then handed over to indigenous/local people. I know where to get a world dataset of borders, I have one already. What I want to do though is categorise them as being colonial or not. As in, when a country was handed over from a colonist back to the people, did the boundaries stay the same? If that’s a yes, then I want that in my dataset for every country in the world. This will be interesting just as a global map. Another interesting question would be whether borders have been changed after having been handed back by the colonists. An example I can think of from Africa is the creation of South Sudan. Are there any other examples you know of? For a given region, say the continent of Africa, I thought it would be a good comparison to see the percentage of borders that have been created by colonists vs by indigenous people, and the percentage that have been changed since being handed over by colonists. Hi Peter, my name is Richard Jurgens, I’m the editor of Africa in Fact, the journal of an NGO, Good Governance Africa, with offices in Accra, Johannesburg and Lagos. 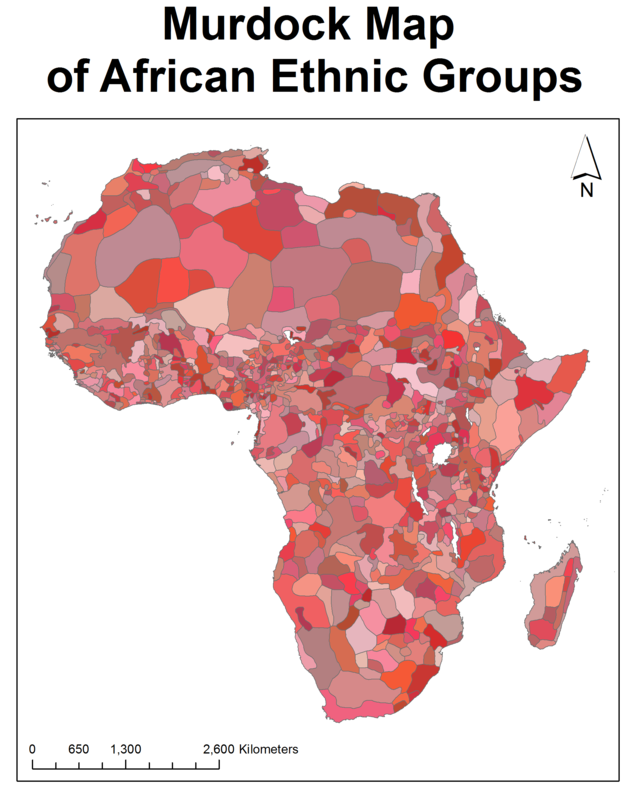 I’d like to publish your two maps with an article about the influence of ethnicity on conflict in Africa. 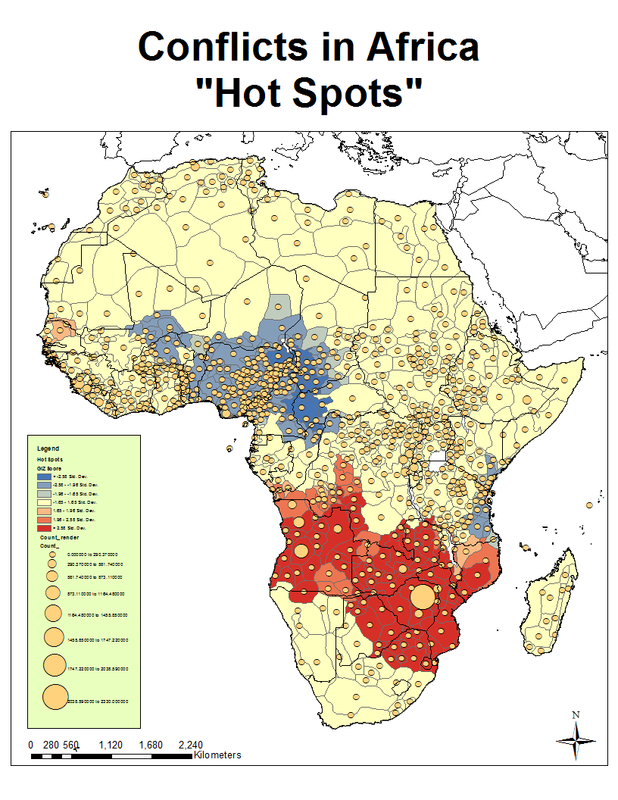 Our author, Michael Schmidt, discusses your map in an overview article of conflict and ethnicity on the continent. We would, of course, attribute the maps to you. Hi,I check your new stuff named “African Conflict and the Murdock Map of Ethnic Boundaries | Freewheel Burning” regularly.Your writing style is awesome, keep it up! And you can look our website about proxy list.